The following story is real. It was implemented in the Summer of 2001 in all North American Starbucks stores and was widely credited [internally] as a hallmark customer interaction program. John Moore (JM): When I was a serving as the Field Marketing Integration Manager at Starbucks in 2001, I was asked to develop ideas for a store level incentive contest. On occasion, Starbucks will use incentive contests to help goose sales. In the past, all incentive contests have been sales-based. This incentive contest was to be implemented in the summer of 2001 and the goal was to ultimately drive sales of blended beverages (Frappuccinos). Knowing that creativity was needed to help solve for this, I called Paul to help me brainstorm ideas around how to create a dynamic incentive program. Paul Williams (PW): When John and I talked about this opportunity we kept mentioning how important sampling is to selling beverages. Sampling of products is encouraged at Starbucks and is a major reason why the company has been so successful. Our stores sample many times throughout the day and whenever a new product is launched, you can bet that Starbucks stores will be sampling it heavy. JM: I remembered seeing a report that estimated for every five samples we would sample to customers, it would stimulate a purchase — a conversion rate impressive for any retailer. PW: Customers will experience two types of sampling at Starbucks — passive sampling and active sampling. Passive sampling happens when customers help themselves to a sample of a product that is sitting on a table or near the main register. Active sampling occurs when a store partner (employee) serves a customer by physically handling them a sample and engaging them in a conversation. Active sampling is by far and away the best way to connect with customers and to drive sales of a product. JM: Right then we knew that we had to create an incentive contest that encouraged store partners to engage in active sampling. PW: As we were brainstorming, we started talking about how much fun we had playing timeless childhood board games like Candyland, LIFE, Connect Four, and Mousetrap. The kitschier the game, the better. We thought it would be great to connect with store partners by turning the incentive contest into a board game — like the ones we used to play as kids. I mentioned that I had recently played BINGO with some friends and that is where we had our EUREKA moment. JM: Paul suggested we model the incentive contest around BINGO. We wouldn’t use numbers. Instead, we would replace the numbers with a fun activity that would ask a store partner to interact with a customer all the while sampling them a beverage. PW: For example, we created activities like: Sample a Mocha Frappuccino to a customer working on a laptop; sample Tazoberry to a customer wearing a red article of clothing; teach a customer to order their favorite blended beverage using the “Starbucks drink language.” For the center squares, we got really wacky with one that asked store partners to get five customers and two partners to form a “conga” line in-store. JM: Not only was this program fun for store partners, it was fun for customers. 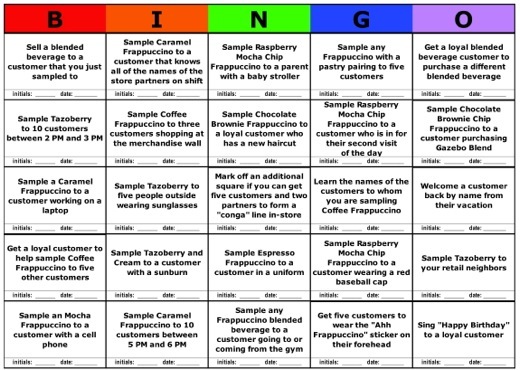 I remember one store sent us their completed BINGO card and a laminated poster that featured photos of their store partners and customers doing all 25 activities on the BINGO card. PW: The end result was sales of blended beverages increased and the morale of store partners increased as well. Just last week, I was at a meeting where someone mentioned this tactic from 2 years ago! Time and time again, Blended Beverage BINGO has been mentioned as one of the most successful ways we helped partners deliver great customer experiences. Now that you know the story, let’s dig a little deeper to better understand how the tactic of Blended Beverage BINGO created great customer experiences and ultimately drove sales. First, it created a fun, interesting way to reward our customers and store partners all the while enhancing the Starbucks culture. Second, BINGO was all about improving the customer service experience. This program encouraged meaningful interaction between store partners and their customers — it created dialogue, offered our customers a special treat and delight, and provided store partners the chance to step out from behind the bar and interact with their customers. Third, the BINGO game was about community. Stores had to make these activities relevant to their customers on that particular day. Partners needed to think about who would fit the requirements for the sampling activity and then interact with them. And fourth, the BINGO game was an innovative way to enhance sales and drive profit. By making sampling fun and top-of-mind for store partners, Starbucks was able to drive incremental sales and profit.